Camels in the desert. Photo courtesy of Visit Qatar. I know for a fact that January lasted far longer than 31 days. Don’t ask me for empirical evidence: it just did, okay? In my football-mad family, it’s impossible not to be familiar with Qatar, or the idea of it at least, since it will be hosting the 2022 World Cup - and having heard amazing things about Qatar Airway’s service standards and about Doha’s “so much better than Dubai” appeal, I decide that a weekend in the Qatari capital might be just the remedy for my January blues. Qatar Airways doesn’t disappoint - the 6.5 hour flight is both effortless and relaxing and, although the three-hour time difference isn’t arduous anyway, I’m more than ready to roll when I reach my destination. Having said that, I’m not in the mood for a holiday bender - I’m not a Dry January proponent (the airline cabin staff bringing me G&Ts will attest to that) but nor do I want to return to the UK feeling worse than when I left - so spending my first night in one of the nine boutique hotels of the dry Souq Waqif is a fine way to start. Hamad International Airport. Photo courtesy of Visit Qatar. The attention to design and service detail is exceptional here. While relaxing with a (non-alcoholic) fruit drink during the seated check-in, we’re at liberty to admire the decoratively tiled floors, plump bolsters on low, square sofas, light-scattering lanterns and ceilings featuring mashrabiya - the instantly familiar carved wood latticework of Middle Eastern countries. Our evening meal is enjoyed al fresco - yes, al fresco! (when did I last do that in the UK?!) against a background of live, traditional music, which the locals seated nearby are enjoying with a great deal of enthusiasm and copious amounts of shisha. I’m not a smoker, but when in Doha … the lemon and mint variety we opt for is flavoursome and refreshing - and our determined puffing earns us the approving fist pumps of the next table. When we set out the following morning, there are two white horses with riders clothed in long, white robes outside the hotel. Maybe they’re just there for tourists, but after a blissful night’s sleep I’m in that delighted state of mind where everything seems wonderfully, authentically exotic and marvellous. The feeling isn’t lessened by my outfit: despite the heat, I’m dressed in light layers from neck to ankle, with arms and legs covered. 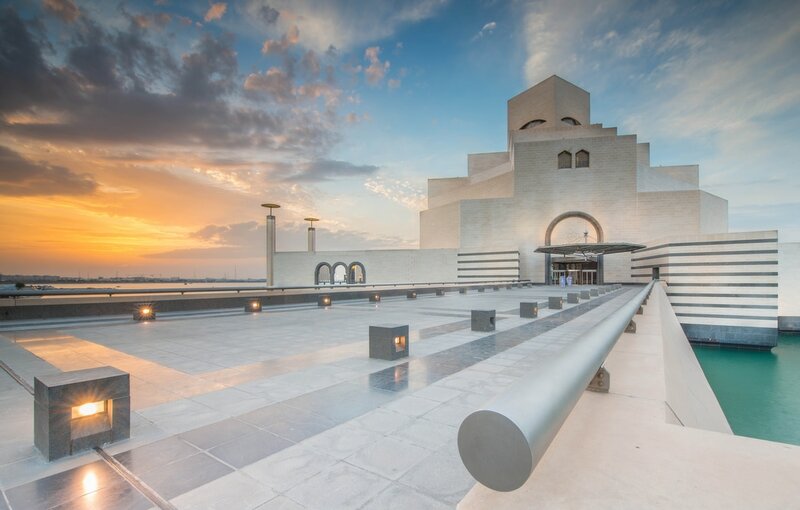 Qatar is a tolerant country, well-used to foreigners, but some degree of sensitivity is required, especially when visiting somewhere as culturally significant as the Museum of Islamic Art, my destination for the morning. The Museum of Islamic Art. Photo courtesy of Visit Qatar. It’s a stunning structure built on a manmade island so that development can’t encroach upon it, designed by Chinese-American architect I.M Pei (best known for the Louvre’s glass pyramid), who, at the age of 91, travelled through the Muslim world for six months to soak up the culture and seek inspiration for his design. The Louvre is brought to mind in another way, too - just as the Mona Lisa’s eyes seem to follow you everywhere, so too do the architectural ‘Muslim woman’s eyes above a veil’ seen from the building’s exterior. Inside, the cool, high spaces are a welcome reprieve from the Qatari heat, and the dim lighting allows each exquisite piece to be beautifully illuminated and showcased. Leaving the museum, we’re surprised by the heaviness of the Sunday traffic, until it’s explained to us that Friday and Saturday form the Qatari weekend: today is a work day. Not for us, however - and it’s on to the St Regis we go, where we sit on the warm terrace at Gordon Ramsay’s Opal Restaurant, which overlooks the incredibly vast pool area. Local and international flavours jostle for your attention on this menu, and the food is as beautifully presented and deliciously fresh and flavoursome as you’d expect from a Ramsay restaurant. Having said that, the hotel houses another eleven dining options … if only I had eleven stomachs, not to mention £11,000, which is approximately what it would set you back to spend one night in the two-story Presidential Suite. Souq Waquif. Photo courtesy of Visit Qatar. 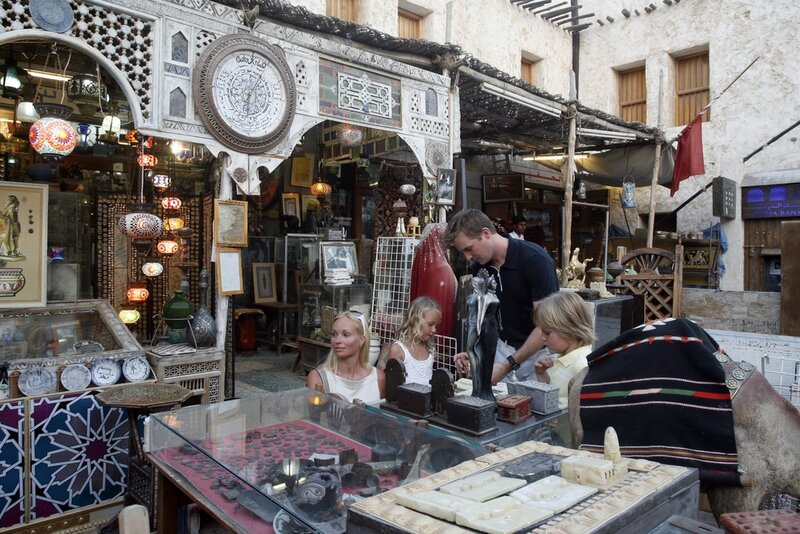 To amble off the post-lunch haze, we head to Souq Waqif which, despite its bustle, is strangely relaxing. Although the buildings themselves are relatively new, they’ve been designed with pleasing authenticity, a nod to the fact that trade and commerce have taken place on this site for many years. Despite the city’s modernity, and a skyline that bristles with skyscrapers (with plenty more to come in the lead up to the 2022) a visit to the Souq is like stepping back into another, more exotic time. Mounds of spices, piles of saddles and rugs, bolts of bright cloth, instruments with unfathomable purposes and glinting silverware are seen at every turn, against the constant thrum of rising and falling voices, guttural and hypnotically soothing. Falcons, their proud, curved beaks thrusting out from beneath their tiny hoods, shift restlessly from claw to claw on the small podiums to which they are chained, unable to see the protective gauntlets and other accoutrements of the sport that line the walls. Swarthy-faced men stride, clad to the ankle in flowing white robes and headdresses, intermingled with clutches of black-swathed women, their eyes bright and shrewd above their face coverings as they make their market selections. A glorious falcon. Image courtesy of Visit Qatar. And so we ease into the evening, with drinks at one of the city’s hippest spots - The Shanghai Club. The cocktails are impressively large and, after my previously dry evening, I’m ready for a fishbowl-sized G&T. After drinking it, I feel as twinkly on the inside as the views of Doha’s striking skyline surrounding this slick bar, which occupies the 43rd and 44th floors of the Shangri-La. Actually, views are something that the Shangri-La does very well - whether from its rooftop pool or any of its seven restaurants. Image courtesy of The Shanghai Club at the Shangri-La Hotel. Once in the desert and stretching our legs, however, we’re surrounded by camels, tents and men in robes, and if you just squint a bit and ignore the pylons dotting the horizon, you can pretty much convince yourself that you’re in the middle of an exotic nowhere. And then it’s back into the 4WD, its tires now deflated and ready to tackle the near vertical walls of the endless white dunes. 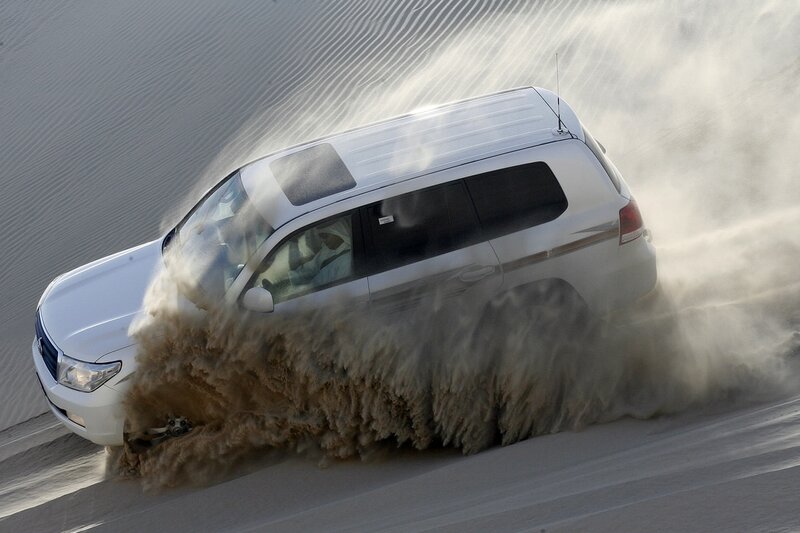 ​Dune bashing, as it’s known, is one of Doha’s must-dos, giving a heady yet controlled hit of adrenaline: it’s that combination of solid vehicle, seat belts on, windows up, with gravity-defying up and down manoeuvres and long seconds where visibility - yes, the driver’s too - is completely obscured by a thick spray of white sand. But then you do end up pretty much in the middle of nowhere (although not quite, because there’s still WiFi - nope, you don’t even have to wait to post your Instagram Stories) surrounded by vast banks of shifting sand and the cool blue water of the Inland Sea. The Gulf Adventures Bedouin camp is fantastically exotic, with low sofas, cushions and carpets in rich colours, plus changing rooms for those wanting to swim while lunch - a plentiful spread of meats, dips, rice and freshly-baked flat bread - is being prepared. Dune bashing. Image courtesy of Visit Qatar. Our accommodation for this, our final night in the city, is a relative newcomer to Doha: the Westin, where that buzzword ‘wellness’ forms an integral part of the brand’s offering: you’re encouraged to take a #westinwelfie for Instagram and to keep up with your exercise regime even if you’ve neglected to pack your kit: just let them know your sizes and they’ll sort you out with a loan. The hotel’s commitment to your health and wellbeing doesn’t stop at the public spaces such as the pool, gym and Heavenly Spa, where I drifted away during the course of a Signature Massage - it’s incorporated into the room design, too, as well as into the fairly virtuous room service menu. That said, there’s no shortage of deliciousness to be enjoyed here, from the magnificent array at the breakfast buffet, to the fantastic meal we enjoyed in Sabai Thai, where the decor and table settings had me in almost as much of a swoon as the meal itself. Image courtesy of Westin Doha. For someone who’s usually chomping at the bit to go, see, do, explore, Doha perfect for a long weekend, however, someone who just wants to luxuriate in the city’s exceptional service standards, eat fantastic food and chill out by the pool, could probably happily spend several more days here. Either way, during gloomy January it was just the tonic I needed to see me into February and to those first, teasing signs of spring in London. Travelpack is offering a six-night holiday to Qatar from £1,385 per person. 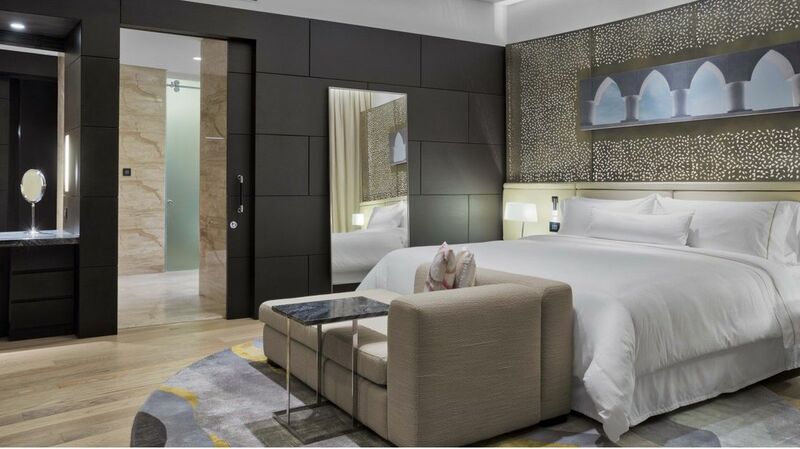 The price includes three nights at The Westin Hotel Doha and Spa and three nights at Souq Waqif Boutique Hotels, both in a deluxe room and on a bed & breakfast basis, with return international flights from London Heathrow with Qatar Airways. When travellers think of the United Arab Emirates, they usually picture shining cityscapes, bustling nightlife and luxury shopping, but located less than one hour north from Dubai International Airport, the enchanting Emirate of Ras Al Khaimah awaits those who wish to escape to a truly authentic Arabian experience. With its crystal waters, stunning natural surroundings, rich cultural history and myriad things to do, this northernmost emirate continues to grow as one of the world’s premier tourism destinations for all the right reasons. With year-round sunshine, mild winters and diverse natural landscapes, including golden sandy beaches, awe-inspiring terracotta dunes and rugged mountain ranges, Ras Al Khaimah eagerly invites visitors to explore its stunning vistas. 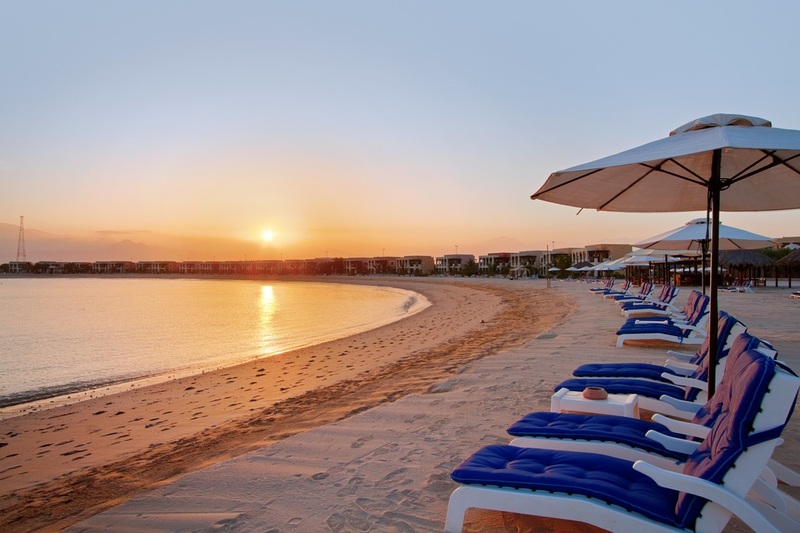 For sun seekers who simply want to enjoy a leisure day on the shimmering waterfront, Ras Al Khaimah’s 60 kilometres of scenic coastline and marine views are sure to impress. On the man-made archipelago of Al Marjan, consisting of four picturesque coral-shaped islands, breathtaking beaches are accompanied by world-class facilities, luxury resorts, hotels and clubs. Feeling a bit more adventurous? Then, head over to the mighty Hajar Mountains, which dominate Ras Al Khaimah’s horizon all the way down to its azure shores, and trek up to the 1,934-metre high summit of UAE’s tallest peak, Jebel Jais. After a hard day’s hike, take a much needed break at the foot of the Hajar Mountains, just 20 minutes from the city, where the mineral-rich pools of Khatt Springs provide a rejuvenating oasis for weary travellers looking to relax. For treasure hounds and time travellers alike, Ras Al Khaimah presents an idyllic destination for true culture enthusiasts, immersing visitors in over 5,000 years of visible history and heritage. Saunter through the Old Town, along the seashore and up the main street of Sidroh, where open-air marketplaces, known as souks, offer traditional arabian merchandise at bargain prices, including textiles, handicrafts, herbs and spices. Peer into a distant past at the Queen of Sheba’s Palace in Shamal, dated as early as 14th century A.D. and reputed as one of the UAE’s oldest palaces. Leave your footprints in the sands of time at the 16th century Dhaya Fort, where soldiers once fought to protect their lands and the only hilltop military tower that still stands in the UAE. For a touch of intrigue, head south to ancestral home of the Za’ab tribe on ‘the red island’ Jazirat Al Hamra, where adobe houses and coral buildings have remained untouched for decades and cast a mysterious atmosphere. History lovers will want to venture into the city centre, where the Ras Al Khaimah National Museum, formerly the residence of the Al Qasimi Royal family, houses a wide array of ancient ornaments and archaeological artefacts, including manuscripts and documents of great value. There are also numerous exhibits and displays throughout the museum about early settlers in the area and traditional life in the emirate. Nearby at the Ras Al Khaimah Pearl Museum, treasure hunters can gaze upon an impressive collection of sparkling pearls, as well as the equipment used to harvest them, while learning about the importance of pearls to the region’s economy and culture. 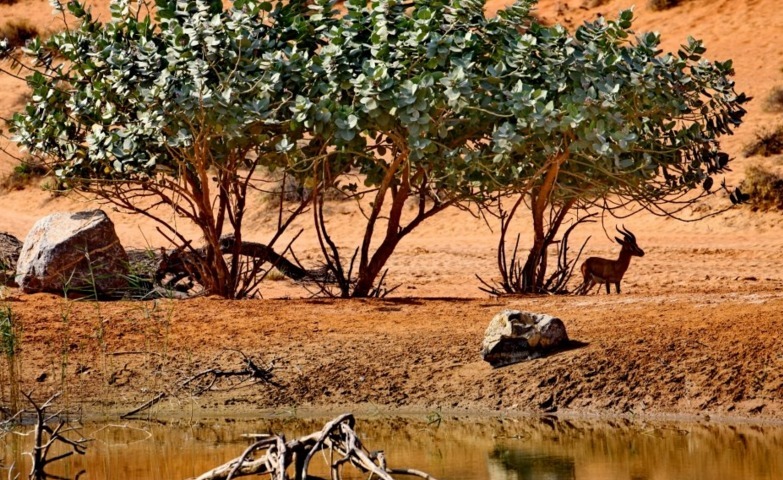 Whether you are interested in desert safaris or authentic camps, camel riding or falcon shows, fishing, water sports or all of the above, Ras Al Khaimah provides visitors with an array of genuine Arabian activities and adventures to enjoy. 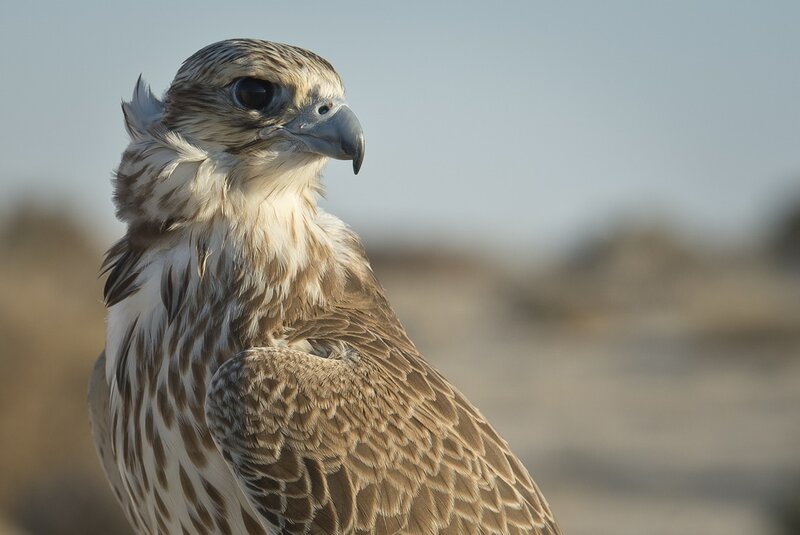 Interact with Arabian Gazelle, Oryx and other unique wildlife on a dedicated nature reserve, or catch spectacular falcon shows at Banyan Tree Al Wadi desert resort and spa. Spend Alladin-esque nights by a roaring campfire in the desert at Bedouin Oasis, an authentic recreation of traditional Bedouin life with real goat’s hair tents, soft cushions on the warm sand and an underground oven for an evening barbecue with mezze platters and freshly baked bread. 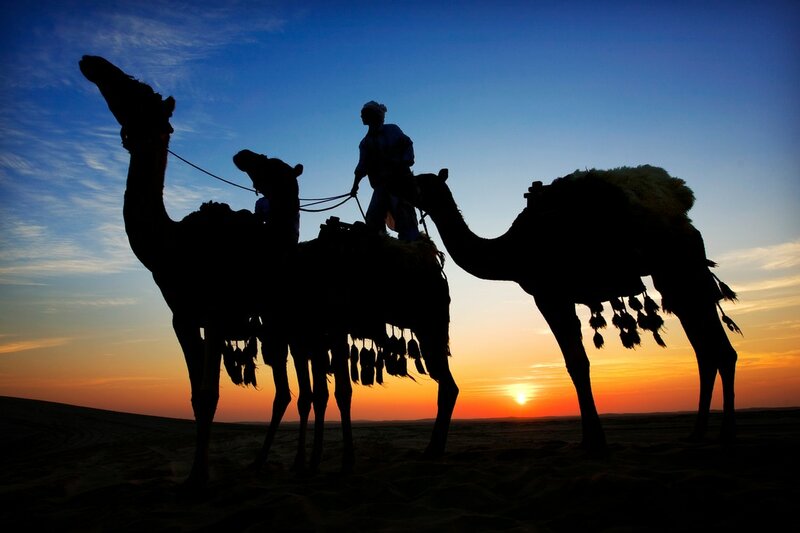 Just steps away, embark on a journey to the romantic Bassata Desert Village and join in on traditional activities,such as 4X4 desert excursions on towering dunes, calming camel rides and safaris, henna hand drawings and belly dancing. For lovers of the great outdoors, the Hajar Mountains provide the perfect terrain for a wide variety of mountain sports and activities, including kayaking, climbing, camping and biking. Golf enthusiasts should be sure to head for Ras Al Khaimah’s world-class golfing destinations, including Al Hamra Golf Club, a Par 72 championship golf course with 7,325 yards of lush greens weaving around four interconnected Arabian Gulf water lagoons. From 26th-29th October, Al Hamra Golf Club will also host leading professional players in a £243,000 tournament during the inaugural Ras Al Khaimah Golf Challenge, the penultimate event of the European Challenge Tour 2016 season. To escape the heat, fun-seeking families and children of all ages are sure to enjoy the themed scenery, games and attractions of Ice Land Water Park in Al Riffa, featuring a wave pool, thrilling water slides and the cascading Penguin Falls, the world’s tallest man-made waterfall. Alternatively, you can always count on Ras Al Khaimah’s crystal clear, calm waters and cool breezes for ideal water sport conditions and choose from jet skiing, parasailing, deep-sea fishing, scuba diving, snorkeling and more. If you prefer to be pampered in the lap of luxury, treat yourself to a traditional hammam bath, massage, facial and body treatment at The Spa at Hilton Ras Al Khaimah Resort & Spa. Or, take a blissful break amidst the rolling sandscape at the Banyan Tree Al Wadi’s new Spa Sanctuary Tented Pool Villas, with a wide selection of soothing massage treatments to choose from. Treatments at the Banyan Tree Spa can also be complemented by The Rainforest, an award-winning, exclusive hydrotherapy facility infused with time-honoured Asian wellness philosophy and traditions. For peace and quiet, the lush greenery and well maintained landscapes of Saqr Park in Ras Al Kaihmah’s Kieran area provide a perfect place to unwind and relax for the evening. Or, take a pleasure walk through Al Qawassim Corniche, spread over 41,000 square feet of luxurious facilities, shops, international gourmet restaurants, cafes and genuine arabian ambiance. For those wishing to escape to a truly authentic Arabian experience, where nature, culture and adventure all meet in one place, Ras Al Khaimah can't be beat. From stunning destinations to scrumptious cuisine and must-stay accommodations, you'll find it here.